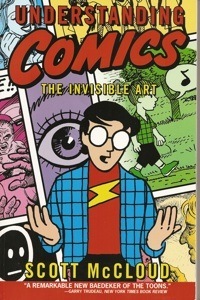 I recently read Scott McCloud’s Understanding Comics, which is a meaty book in graphical layout, about the history of comic books (or, perhaps, of graphical storytelling), and some of the fundamental theories surrounding art+words=story. McCloud breaks down graphic storytelling, giving a solid foundation for understanding the artistic theories as well as the underpinnings of composition. What he doesn’t do as well in this book is discuss the story part of the comic book, the development of story arcs, and how words play a role in the telling of a comic book story. This is because, by McCloud’s own admission, a comic book needs to be sequential, but it doesn’t need to have words to tell its story. As a writer, I would challenge that, but I know my challenge would be hollow. In the right artist’s hands, your script doesn’t need words– the art acts as the words (my own artist sends me the un-lettered version of each page, and I can always see the story, even without the words). But, also as a writer, I know that the story still exists in word, even if it’s not expressed that way in the artwork. As a reader of comics, I find myself focusing on the words, not the pictures, for the story. I often wonder if that’s a function of not being a very practiced comic book reader (it took me a few months to get the hang of listening to audiobooks, too), or if it’s because I’m a verbal learner, rather than visual. Or if I’m just not attentive enough to the graphic novel, and need to slow down, take my time, to savor the story. Meanwhile, over at Fractal Hall, they’re posting a meta-analysis of some of the great icons of comic book superheroes, tagging them “delineated.” So far, they’ve delineated Batman, Wonder Woman, Superman, and The Flash, with great insight and introspection. This entry was posted by Stephanie	on Sunday, October 19th, 2008 at 10:10 am and is filed under Uncategorized. You can follow any responses to this entry through the RSS 2.0 feed. You can skip to the end and leave a response. Pinging is currently not allowed. I also find myself devouring the words in comic books rather than savoring the art. As much as I love the medium, I rarely have the patience to slow down and delve into each panel. I prefer comics with character-centered stories and a pace that keeps me turning pages. I find myself getting resentful when I read Alan Moore, who requires close attention to detail and likes to play with layouts that intentionally make reading difficult. You know, I’m curious about how the rest of our “gang” will weigh in on this issue, but I also find the words to be pretty much way more important than the pictures. It helps to have great pictures, great art, but that really is secondary to me when compared with the story and text of the comic. Perhaps that’s our thing. This is ReadComics.org, after all. Thanks for the shoutout! It is very much appreciated. I’ve discovered that I find myself paying much closer attention to the art more recently, than when I read as kid. Perhaps I’ve gotten better at merging the two parts now. But I do find myself studying panels more than I used to. Not just Top 10 panels either, trying to find all the Easter eggs. I wonder if maybe trying your hand at drawing yourself is changing the way you view comics. This is definitely happening for me. I find myself looking at transitions between panels, and thinking about why they made the choices they did when laying out the page. Something I never used to do. @Madeley: Keep up the good work. It’s relevant because I’m in the middle of reading Justice, but I particularly liked the The Flash, Delineated post.